Mysticism and Magic have been a part of Alexandre's life since childhood. The mysterious has always intrigued him. 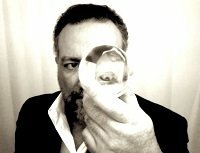 Alexandre has extensive experience in the world of Entertainment and the Metaphysical Sciences. He is a Reiki Master, a Master of Meditation, a Qigong Practitioner/Instructor, and an Ordained Spiritual Minister with a Doctor of Divinity Degree. As an award-winning Mentalist/Psychic Entertainer he performs regularly around the world and consults for television and stage. He's also the past vice-president of the Historical International Brotherhood of Magicians Ring 45. A frequent traveler, Alexandre currently resides in South Florida, and part of the time in a haunted cottage in Derbyshire England. 6 easy Native American themed mentalism routines. This eBook first released in 2006 disappeared a year later and returns now in its original form. So what is a Pow Wow ? Intuitive ability is more common than you might think. We all have it but most of us never use it, we're blocked, our minds too busy, distracted. In Anomalous Cognition Mystic Alexander presents an empowering approach to the "Which Hand" effect. Created to empower the subject, not just show how "clever" we are! Note: Anomalous Cognition should not be performed as a "trick" for maximum effectiveness, but rather as a fun/casual "experiment" or "test". This manuscript was previously called Psychic Destiny published in 2005 and was unavailable for a while, but it has returned with extra notes and stronger than ever! In Intuitive Dimension you'll present a Psychic Test or an Experiment to your subject. You could even present this as a Unique Psychic reading. From a short stack of business cards you hand her one, and have her write or draw anything she wants on the blank side ... a number, a name, a picture, a question ... whatever comes to her mind intuitively (or you can use completely blank business cards, no matter). Four Unique Playing Card Routines! Featuring Dr. Wendy Woo's RV Experiment VERSION 2. You can do this over the phone and this alone is worth the price of the manuscript. This manuscript was written in 2009 and a release was intended then, but for various reasons not done so. Finally, here it is. The Book of the Dead is often translated as the "Book of Emerging Forth Into the Light" which consists of a number of magic spells intended to assist a dead person's journey through the Duat, or underworld, and into the afterlife ... so begins the Cards of the Dead - The Egyptian One-Card Reading . NO sleight of hand - NO complicated tactics! PAGANINI - The violin virtuoso fuels rumors of a pact with the Devil by demonstrating his amazing relationship with velocity using a deck of cards. STALKER - A female participant chooses her actions, and a card, but in the end she can't avoid the "stalker's" confrontation. This was the first booklet I published way back in 2002 and it was born out of a lecture I did in Rio de Janeiro, Brazil where I ended by discussing The Art Of Performance In Magic And Mentalism and answering questions on the subject. It's a brief manuscript with strong messages to reflect upon concerning principles that will enhance your rounded approach to becoming a respected performer. Is There a Quicker Way To Become a Better Performer? How Do You Keep Spectators From Messing You Up? Please note that this download product does not include Tingsha bells. The Tibetan term 'ting' refers to the ringing sound of metal, to the cadence of a musical note. 'Sha' means hanging or suspended. When the two pieces strike each other they produce this clear, pure, cleansing sound, which can be used to focus the mind before and after meditation. An improvement on the Si Stebbins stack. This was one of my first offerings to the magic and mentalism community back in 2002! It solves the noticeable alternating color pattern problem of the original Si Stebbins stack while allowing you to continue to perform every effect you've always performed with this incredibly easy stack. You will no longer be afraid to show the faces of the cards while performing. This is an Exciting, Unique, Original, tic sheet I've been using for a couple of years to incredible success! Client's LOVE IT! And I wanted to share it with you. For a long time I did readings using the actual Pai Gow Tiles. As far as I know I was the only one doing Pai Gow Tile readings in the US and possibly the world. But carrying the tiles around got tiresome, so I developed these incredible tic sheets. The Contents Herein Are For Psychic Entertainers Who Want To Come Across As The Real Thing. For the most part, these routines will not come across effectively unless they are presented with an air of believability. If you don't intend on presenting these as real demonstrations, please do not purchase this manuscript as there will be, with a couple of exceptions, little information of use to you. I am involved in the metaphysical community and these have all been demonstrated in that environment. Not to be taken lightly. Previously released exclusively within the PEA (Psychic Entertainer's Association) this is a quick and easy visualization experiment where your subject imagines colorful butterflies frolicking around a water fountain in a magical garden. This is good for the psychic entertainer in casual settings, perfect for one on one while waiting for a meal, or hanging out in your library in front of the fireplace. Four Mentalism effects using playing cards in unique presentations! This is the ORIGINAL! Do not be fooled by imitators. Released back in 2005 (and briefly in 2013) Astragalomancy , the hottest dice reading system for the Psychic Entertainer is back! And you should have the system down overnight! No kidding! 1st edition 2005; 16 pages. This routine will require some creativity on your part, but more so on the spectator’s part ... but this is part of the fun. It can really go anywhere and it’s usually just as interesting to the performer as it is for the participant. 1st edition 2008; 3 pages. The Aeon Reading is a mysterious Tarot card reading/experiment that will leave your participant wondering about the mystical powers of the Tarot. It will also leave them with an important message. If you perform at all with Tarot cards, you’ll surely be using this routine which has been in Alexandre's repertoire for years. Written for the Thoth tarot deck (where the Aeon card is the 20th card) it can be automatically adapted to any tarot deck you might already own. This is based on a self working principle - no sleight of hand required. 1st edition 2005; 3 pages. Beneath The Mask , co-written with Alexandre, is the last manuscript Anabelle chose to release to the community back in 2007! It's been off the market for a number of years, but now it's back! IMPORTANT NOTE: This is the original 2007 release with the original cover on the PDF and original content. Dr. Wendy Woo (current whereabouts unknown) will teach you how to fake her remote viewing abilities with an ordinary deck of playing cards and an extraordinary token (of your choice). Dr. Wendy Woo has been involved with remote viewing for nearly a decade and considers herself a "consciousness researcher who has sometimes experienced altered states of consciousness." This experiment may be performed in person or OVER THE PHONE!